The Dean's Ambassadors shall be focused first toward the promotion of the University of Georgia School of Law in the public arena and second toward the provision of maximum service for the betterment of the University of Georgia School of Law. 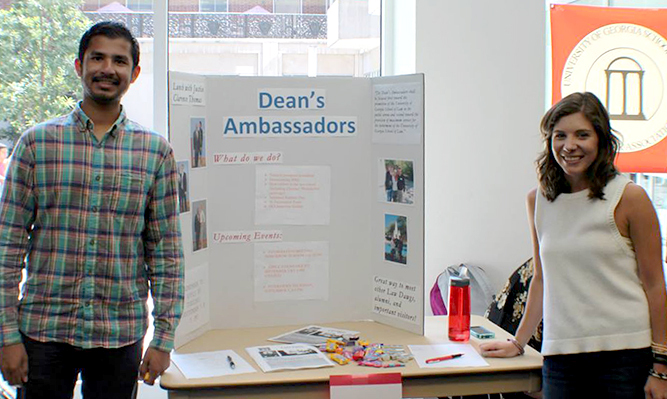 The Dean's Ambassadors organization focuses first on the promotion of the University of Georgia School of Law in the public arena and second on the provision of maximum service for the betterment of the law school. All requests are shared with all Dean's Ambassadors and assigned based upon availability at the requested date and time. Please note that every effort will be made to assist you with your event. However, please realize there may be events we will not be able to staff or staff completely due to the timing of the event (exam time) or the nature of the request (too long of a time commitment by one person, e.g., Atlanta airport transport is difficult to arrange). After submitting this form, we will be in contact with you shortly regarding our ability to assist with your event. If you do not hear from a Dean's Ambassadors representative within 48 hours of your request, please email Nora Eastham at neastham@uga.edu.